Embedding Structured Query Language (SQL) within PHP, or other programming languages, has been problematic for some. Mixing two programming languages together is just plainly not aesthetically pleasing. Especially when you have a declarative language (SQL) mixed with a procedural-object oriented language. But now, with the MySQL XDevAPI PECL extension, PHP developers can now stop mixing the two languages together together. The MySQL Document Store eliminates the heavy burden for SQL skills. It is designed to be a high speed, schema-less data store and is based on the MySQL JSON data type. This gives you roughly a gigabyte of store in a document format to do with as needed. So you do not need to architect you data before hand when you have no idea how it will evolve. No need to normalize your data. Now behind the scenes is a power MySQL database server but you are no longer writing SQL to use it! But Is The Code Ugly? If you looked at previous editions of this blog then you have seen examples of using the MySQL XDevAPI PECL extension. There is another example below of how to search for the information under various keys in a JSON document. The great news is that the code is all very modern looking PHP with no messy SQL statements thumb-tacked onto the code. This should ongoing support by those with little or no SQL skills. Previous you would have had to stick SELECT JSON_EXTRACT(doc,'Name') AS 'Country', JSON_EXTRACT(doc,geography) as 'Geo', JSON_EXTACT(doc,'geography.Region) FROM world_x WHERE _id = "USA" as a string in the PHP code. If you prefer the -> operator to replace JSON_EXTRACT, the code can be trimmed down to SELECT doc->"$.Name" AS 'Country', doc->"$.geography" AS 'Geo', doc->"$.geography.Region" FROM world_x WHERE _id = "USA". 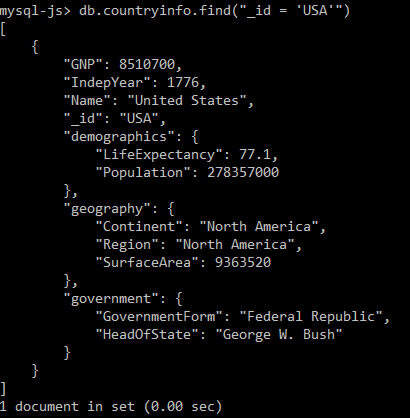 But the XDevAPI simplifies these queries into $result = $collection->find('_id = "USA"')->fields(['Name as Country','geography as Geo','geography.Region'])->execute();. This is much easier to understand than the previous two queries for most. And this example shows how to chain down the document path as it specifies all of the geography hey's values and also just the data under geography.Region. It also show how to alias columns from the document store to a label of the developers choice. The MySQL Shell User Guide is a great place to start learning how to interactively start using the Document Store. The find() function for the MySQL Document Store is a very powerful tool and I have just finished a handy introductory video. By the way -- please let me have feed back on the pace, the background music, the CGI special effects (kidding! ), and the amount of the content. For those who want to follow along with the videos, the core examples are below. The first step is to connect to a MySQL server to talk to the world_x schema (Instructions on loading that schema at the first link above). You can reach deeper level items by providing the path to the object such as db.countryinfo.find(‘geography.Continent = “North America”). Be sure to remember Case Sensitivity!! But what if you do not want all the document but just a few certain fields. Then post pend .fields([“Name”, “GNP”]) to find(). And once again you can dig deeper into the document with specifying the path, such as.fields([“Name”, “GNP”, “geography.Continent”]).sort(“GNP”). Yes, you can easily sort the output from find() by adding .sort(“GNP”,”Name”) at the end. Of course you can make the find() function perform more complex dives into the data such as db.countryinfo.find(‘GNP> 500000 and IndepYear > 1500”). I am starting a series of videos on the MySQL Document Store. The Document Store allows those who do not know Structured Query Language (SQL) to use a database without having to know the basics of relational databases, set theory, or data normalization. The goal is to have sort 2-3 minute episodes on the various facets of the Document Store including the basics, using various programming languages (Node.JS, PHP, Python), and materializing free form schemaless, NoSQL data into columns for use with SQL. The first Episode, Introduction, can be found here. Please provide feedback and let me know if there are subjects you would want covered in the near future. I have had quite a few questions from PHP Developers who are very interested in the new MySQL Document Store versus the traditional use of MySQL with PHP. You used to have to write queries in Structured Query Language (SQL) by outing them in strings withing your PHP code. In the past I have heard many folks complain about having to use a programming language within a programming language. And several of you have just skipped all than an started using an ORM. And roughly two percent of the developers at conferences tell me they have had any formal training in SQL, relational theory, or sets! So what changes with Document Store? The first and biggest changing is that you stop writing queries in SQL. SQL is surprisingly hard for many programmers. Part of this is that SQL is a declarative language. CSS is also a declarative language. These languages describe what the desired output looks like. Most other languages assemble the parts to get the desired output. The second is that you your code stops looking like string handing routines. Compare $result = $mysqli->query("SELECT doc FROM countryinfo WHERE _id='USA'")) of the traditional embedded SQL code embedded in the PHP code to $result = $collection->find('_id = "USA"')->execute() of the Document store. The good old mysqli extension is still a powerful way of getting data in and out of a MySQL server. But now you have another option that just may fit better with your programming paradigm. PHP Developers can now try the MySQL Document Store by using the MySQL X DevAPI for PHP PECL Extension. Developers in other languages have had access for a while but now PHP coders can get in on the action and use the MySQL Document Store. // SELECT * FROM world_x WHERE _id = "USA"
Well, PHP code is PHP code. The big changes is that the developer no longer needs to use Structured Query Language to talk with the database. Now one connects to the schema of choice, sets the collection to use used, and then finds the record(s) of choice. Zero SQL involved. PECL is the PHP Community Library which houses all sorts of treasures. Now it also houses the MySQL XDevAPI extension. I have had the best luck with downloading the software and building it on my system following the directions in the README file. This is not an easy build but keep plugging and you will get it built. More PHP and MySQL Document Store code!